Looking in old papers and files I came across a file titled "Poems for Publishing". 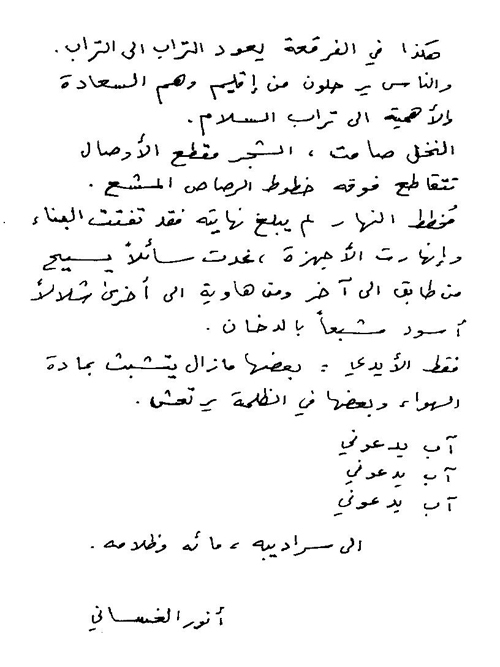 These are poems in Arabic, some typed, some hand-written, which I had selected for publishing few years ago but never sent them out. They are selected from various unpublished complete collections. Although some were written twenty years ago, they are still waiting for my negligent soul to move and publish them. Please find the first scanned and uploaded poems in the section titled "Poems-EXTRA" (above). I have no time to write them in the computer, therefore, I am scanning and publishing them gradually as images. Please visit frequently. I am always adding new poems. Standing from r. to l.: Mahdi Mutashar (painter, from Al-Hilla, now in France), Yahya Ash-Sheik (painter and sculptor, from Al-Imara or Baghdad, now probably in Iraq or Syria), Ali Talib (painter, from Al-Basrah, I don´t know his current whereabout). I do not remember the names of the others. 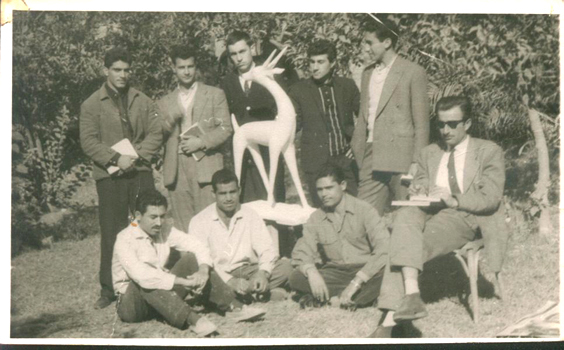 Sitting, from r. to l.: Anwar Al-Ghassani. I don´t remember the names of the other three. I am sitting in the garden of the villa that was then the Academy of Fine Arts in Al-Iwadhiya district of Baghdad. The garden extended some hunderd meters and reached the bank of the Tigris river. The students in the photo were all of the first year of the painting section in 1962-1963. Missing from the photo are: the late Layla Al-Attar (1940-1993, painter, died on June 27, 1993, together with her husband and housekeeper during a US missile attack on Baghdad), Saida Al-Assmar (a Palestinian, I don´t know her current whereabout), Shaker Hamad (painter, from Al-Imara, I don´t know his current whereabout), and Sawsan (painter, I don´t know her current whereabout). The photo dates to the period of September 1962 - January 1963. Those were the first months of the first year of my study of painting at the Academy. I was happy since I had finally, after waiting for seven years, achieved enrollment at the university. Although literature was my preference, I was happy with painting, my second preference. This calm, indeed serenity in the photo, will soon change. on February 8, while we were in our short two weeks winter holiday, the Baath party overthrew the military regime of General Abdulkarim Qassim, who was executed together with his closest aides. A violent campaign of summary executions, arrests and confinement of thousands of people in concentration camps followed. It would last until November of that year when a new coup d´etat would remove the Baath party from power. When we returned to the Academy after the winter holidays, students who were Baath party members started arresting leftist students. Then we were told that we would be leaving the villa and would have lectures and workshops at the old Institute of Fine Arts. There, one day in March, I was arrested by the National Guard (the Baath militia) unit at the Institute and sent to the Olympic Club which the Baathists had converted it to a detention center. Later, I will discover that two reactionary Turcoman students from my hometown Kirkuk at the Institute were the ones who denounced me as a communist. That was the start of my detention for eight months in different places. I was finally sent to Kirkuk where I stayed in detention until the Baath was removed from power. I was released on bail and went back to Baghdad. At the Academy, the Baathists were still there and the atmosphere was still hostile. I decided to give up my study and went to work in the press as a translator and editor. Later in 1964, I had to stand trial at the Fourth Military Court in Kirkuk. With the help of a high officer, a distant relative, I was finally acquitted and released. Back to the photo: I clearly remember the names of my co-students who mattered to me and I have forgotten the names of the rest. There is something strange about me in the photo. I am the only one formally dressed, sitting there, busy doing something as if the photo and the people around me didn´t interest me. I am immersed in my "world". It is perhaps because of this character feature that others considered me a somehow inaccessible person. Decades later, one of my students when interviewed about me would say she thought I was a mysterious person. Honestly, there is nothing mysterious about me. Admittedly, I have always been choosy and demanding. I never or rarely wasted time on persons and issues that were of little value. Some people thought I was too strict and lacked spontaneity. I think that is a misperception. the one who wanted to repair As-Sarrafiya bridge in Baghdad. at the kitchens in Iraqi homes. Is this real or only words? or from dreams, despised and difficult to write about? then it follows that I am a person of culture. Finally, I now know where to find my book "Al-Iraq", my epical poem about Iraq. 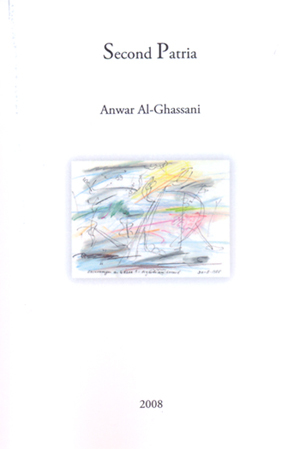 This book consists of one epical poem of 96 pages which I wrote in Arabic in 1991 during the first Gulf War. 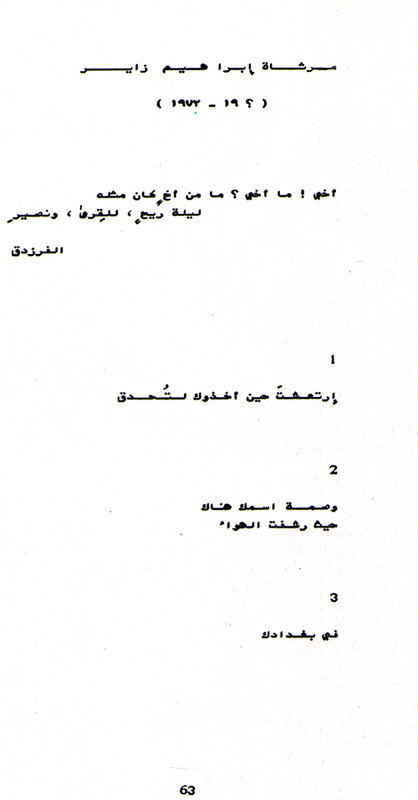 The poem was published in 1992 by Riad El-Rayyes Books (London, Limasol, Beirut). At that time, the publishers sent me $300 and 20 copies of the book. After its publication, there were some very positive reactions from critics with the exception of one who wrote a stupid thing, not about the poem but about me. He blamed me for being too optimistic about Iraq !!! And that was that. Since then, I never again heard a word about the poem, neither from scholars, critics or readers, nor from the publishers. The poem faded into oblivion in the mostly phlegmatic and superfial poetry appreciation in the Arab World. Last year, I found a reference to the book under my name at amazon.com. The book was described as being out of print. This went on until yesterday, October 28, 2008, when, by pure coincidence, I came across a Lebanese book vendor website, neelwafurat.com, where I found the book listed for sale. Sixteen years after its publication the poem is still available in its first edition/ printing. It seems Arabic poetry readers haven´t been queuing to buy the poem that carries, at least since 2003, the name of a modern Arab tragedy. This is the state of low appreciation for serious poetry in the Arab World that never seizes to praise itself as a world of poetry lovers and expresses solidarity with Iraq day in day out, but when it comes to translating this into a small action, like buying a poem about the Iraqi tragedy, well, no, that is then too much an effort. I am generalizing, yet I do believe the Arab World deserves such a harsh judgement. However, I do see also the exceptions, there are exceptions to this in the Arab World. Incredible! I couldn´t believe it. The site offers the book in this funny way: market price: $3, our price. $2.55. Oh, god, imagine this miserably low price. In December, I am planning to buy some 20 copies. Before that I will write to Neel wa Furat to thank them for reviving my hope and giving visibility to my book. Why have you forgotten Fellini? film-makers of the 20th century. we move to the next lovers´ den. to be, and to do. This sweet photo from 1940 or 1941 is the starting point for an essay I am writing in Spanish. Tentative title "The Mother of the Poet" or "The Poet and his Mother" (La madre del poeta o el poeta y su madre). In the photo, from l. to r.: my mother Munira Sayyed Tahir carrying my brother Farouq, then myself carried by my uncle Ahmad Sayyed Tahir. The photo was made in 1940 or 1941 at my birthplace Qal´at Salih, in the southern Iraqi province of Al-Imara, probably a year or so before my family moved for good to the norhern Iraqi province of Kirkuk. At the time of this photo, my mother was a 25 years old young mother. My brother Farouq, 1 year old, I was 3 years old and my uncle (in scouts unifrom) probably 12-13 years old. The essay starts with a detailed description of this photo. After that it explores the relation between me and my mother throughout her life and until her death in 1973, partly as mother and son relation, but above all as a relation between the poet and his mother. Furthermore, I will try to describe and understand her life and, I hope, I will be able to create a lasting monument for her as a great mother. The cover, handicrafted as an envelope. Stamps on the cover. The one to the right carries the image of the late King Ghazi (1912-1939). The stampt was issued during the years of his rule (1933-1939). 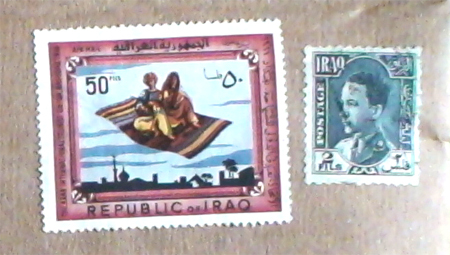 The other stamp dates to 1966. It carries this information "The Arab International Tourist Union, Baghdad 1966". It was probably issued on the occasion of a congress in Baghdad. The stamps are originals. They are not reproductions. 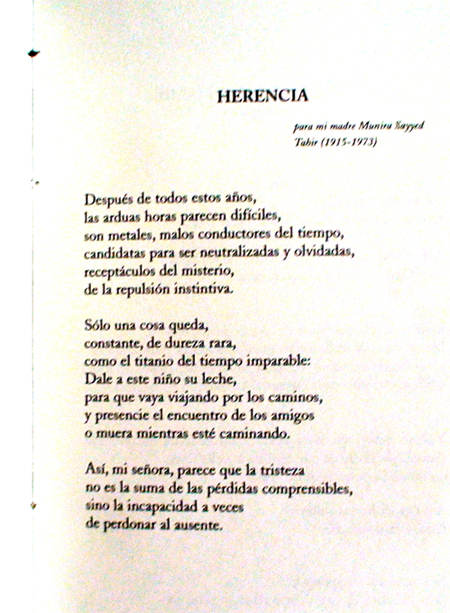 Herencia (Heritage) one of my four poems published in the anthology. The poem is dedicated to my mother Munira Sayyed Tahir (1915-1973). The other poems are: Jk, Teniente Salah Jamil - un épico ( Lieutenant Salah Jamil - An Epic), Balance después del desastre (Stock-Taking After the Disaster). The other participating poets are: Nedhal Abbas (4 poems), Sinan Antoon (3 poems), Adeeb Kamal Ad-Deen (1 poem), Adnan Al-Sayegh (1 poem). All poems were written in Arabic, translated to English and then to Spanish except the poems of Anwar Al-Ghassani which were written in Spanish. 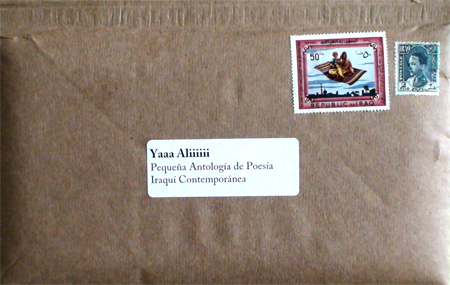 ------ (2006): Yaaa Aliii - pequeña antología de poesía iraquí contemporánea. Buenos Aires: Clase Turista, 46 páginas. counterfeited in stone and sinking. Soon the nearby sea will take them to his garden. 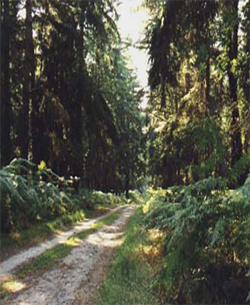 Der Darss: The Darss peninsula, Germany. La calidad del sonido y de video no es para decir que bruto, pero estoy muy agradecido a los amigos de la revista Prometeo y del Festival Internacional de Poesía de Medellín por poner este video en YouTube. Este poema fue escrito en árabe. Su título "Embellecimiento después de mi nacimiento en Ur" pero ya lo pusieron otro título "Como llama blanca" que me parece bonito. La lectura se llevó a cabo en una linda sala de cultura en una calle principal, una tarde en la bella Medellín. 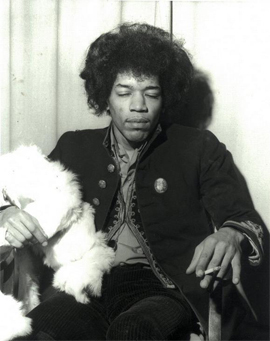 Jimi Hendrix slumbering. To the right, a detail from the cover of his 1968 album Electric Ladyland, the final album of the series "The Jimi Hendrix Experience". sunken vessels, separated, each in a region. 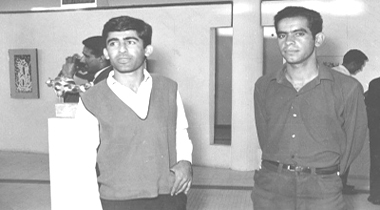 My dearest friends, Ibrahim Zair (1943?-1972) - right -, poet, journalist, graphics designer and painter, and Sargon Boulus (1943-2007) - left -, one of the greatest poets of modern Iraqi and Arabic poetry. The photo was made in an art exhibition in Baghdad in mid sixties. they might crash and die or lose limbs. is here and alive are the hills. to be presented as a gift to whoever passes by. freshening up their outdated sense for procreation. They harvest some and bring them to an altar. They project them on a screen and observe the nectar dripping from their voluminous violet conic crowns. secreting a sweet fragrance. Then the protocol master, agitated by intense illumination, would scream: "You sinners! You bandits! ", then waves of screeching music dashes out into the dry night. They harvest the sounds. So much meaning pertains to the chaos. They clinch to their illusions, their only knowledge and shelter. "O, night followed by tender early morning hours", they say, "we have not yet written our farewell from our beloved land. We yet have no tears. Our love is stable and stony for thee our land." embroidery of chromatic steel, outmaneuver them from these plains of screams where fires and flames are dropping on agonizing souls of creatures born without the explicit will of a creator. They fly away into a denser light, to a spacey region where they finally find food. the prohibited, untouchable, my addiction. a reunite, an eliminator of mind´s despair. make the silent transition for both. That was your reinvention of us. undefined in the sweetness of your presence. as cold wind cuts the skin of little hands. touched by the frosty wind of sun. wasted blood, spring water, mourning. Sie schafft ein immer lebendiges Bild von sich selbst. was the pendulum of daily life. we obtained her adolescent aroma. the collective joy of our days. 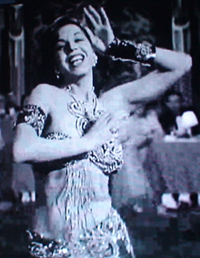 Please note that of video 1 only the first half is about Samia Gamal. Both videos are of moderate quality (what is available on You Tube). I hope I can get some videos of a superior quality at some point in time. Due to my negligence and publishing difficulties this collection, written in 1993, remained sleeping among my papers during fifteen years. I didn´t even try to publish individual poems from the collection (perhaps with the exception of one or two). I have now decided to do justice to the poems and publish most of the collection here at my Website until I have enough money to publish it as book on demand as I did with my recent collection "Second Patria" (see below on this page), or until some philanthropist comes along and volunteers to finance the publication of the collection. 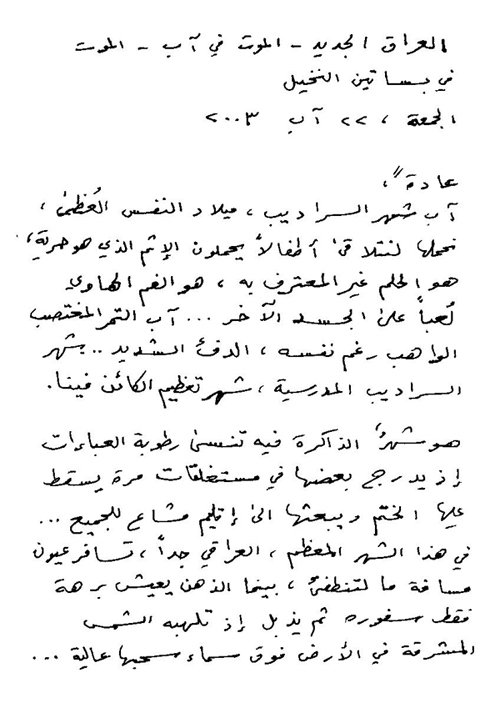 Due to temporary difficulty with editing Arabic texts, I am scanning the poems and uploading them as images. Please use the zoom device to enlarge the text if necessay. Finally, without intending to be pretentious, I consider these poems as fairly good, something I do not easily and always state about my poems. Please read and decide for yourself. Click here to go to the Poetry Section, there click on the name of the collection under "Poems in Arabic - II"
"Sojourn At The Beach In Varna - Humorous And Entertaining For My Friends"
46 poems, 76 pages, written in English about German themes. Published by Book Surge Publishing. Description: Poems written in English by Iraqi poet Anwar Al-Ghassani as an homage to Germany, his second homeland, where he lived, studied and worked during three periods between 1967 and 1983. Those were years of his emotional and intellectual maturing and growth, of creative and happy times. They were also his years of the motorcycle and of explorations. These poems are also about reminiscences and about his almost yearly visits to Germany. They are about wonderful people, friends and places. 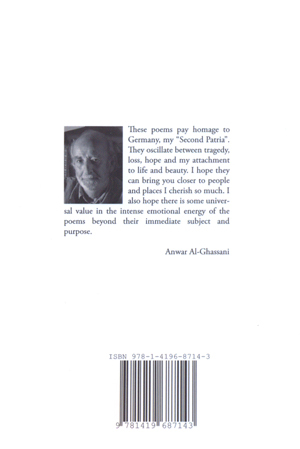 Al-Ghassani writes poetry in Arabic, English, German and Spanish. in the umbrage of dawn. only the promise of lips. by white silence, that of birth. nourishers, power of a later wakeup. - The photo where I am standing opposite to a street photographer was made when I was in the second year of the secondary school. The suit I have on was new, but it doesn´t look like new because the quality of the photo has deteriorated. I remember that I wanted to be photographed to celebrate the new suit. Place: Kirkuk. Date: 1950. 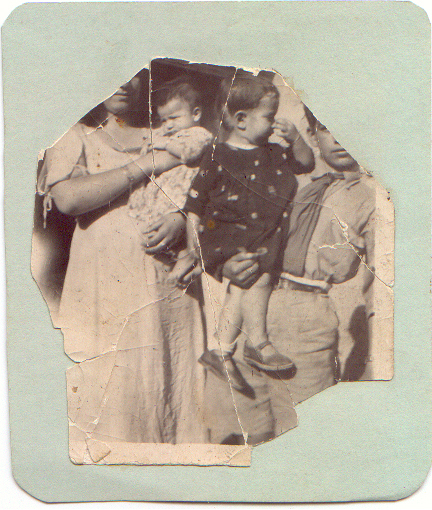 - The photo of my father (with me, in shorts, to his right and my late brother Farouk to his left) was taken most probably between 1948-1949. Place: unknown, probably Kifri or Kirkuk. - Myself standing in what seems to be a field. Place: Kirkuk. Date: around 1965. - Myself standing in one of those cheap popular bars at Al-Bab Ash-Sharqi in Baghdad. Street photographers used to come to those bars asking people if they wanted to have photos. The name of the studio to which the photograper belonged can be seen down to the right. It reads "Studio Opera". It was one of those photo studios in Al-Bab Ash-Sharqi. Date: 1965-1968. See previous front page of this Website, the one which was pulled down on Monday, February 4, 2008 and replaced by this page. The past is folded, conserved and stored. It can now be retrieved as images. mountains, gorges, hills, snow and rivers are silent. to protect their DNA for their successors. Day and night, this land runs amok against itself. fuzzy horizons, and fata morganas. I am not the savior. words - food and comfort.